Blues Blog - get news on all Blues matches at the Blues Blog! 4/3/09 - Blues recieve federal tax exempt statis (501c3). Contributions made to the club are tax exempt under section 170 of the federal code. We are classified as a public charity. 4/2/09 - Blues announce that Pheonix Bats will build a replica of "Shoeless" Joe Jackson's original "Black Betsy" for team use! 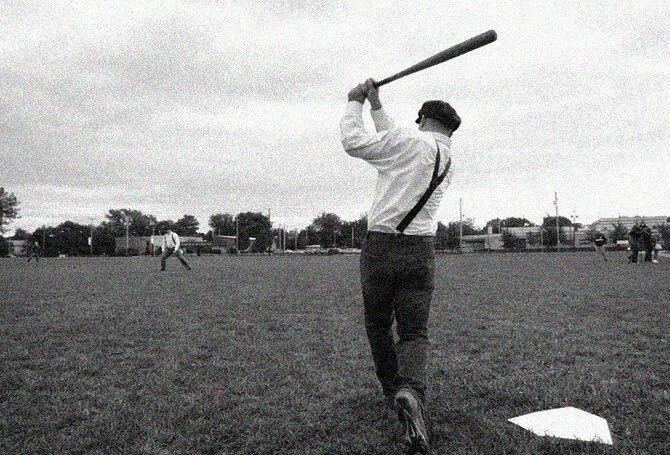 3/30/09 - Blues attend Vintage Base Ball Association Conference in Cincinnati. 2/9/09 - Blues Announce The South Bass Island Vintner's Cup.doc Tournament for October 3rd, 2009. 12/30/08 - Neal "Bristles" Dobrovic hand builds mushroom bat. 12/30/08 - Ken "The Hammer" Schutz to hand build "The Hammer" bat - vintage style. 11/30/08 - Barley Pop Fundraiser a success, netting $980 for the club including corporate donations from Schutz Builders and IDS Construction Solutions. The Club revealed the Western Reserve Base Ball Memorial at the Clevelander, unveiled thier jersey design, and new team logo. 11/17/08 - Blues to hold fundraiser, "The Barley Pop Fundraiser" at the The Clevelander on 11/29/08 - All proceeds go to the Cleveland Blues Base Ball Club. 11/13/08 - The team met and ratified our Constitution on 11/12 at The Clevelander Bar & Grill. The Blues released thier 2009 schedule and finalized our roster for the year. Russ Haslage of the League Park Society was there to speak to the Club about the issues surrounding League Park and its renovation. In true club fashion, the boys (and girl) drank a few barley pops.